The Darjeeling district administration is mulling legal advice to cancel the lease of the Alchemist group, which owns three tea gardens in the hills, for defaulting in paying workers’ dues and remaining absent from meetings called by the labour department. The Alchemist group is owned by former Trinamool MLA K.D. Singh and operates the Kalej Valley, Dhootriah and Peshok tea gardens. Dues including workers’ provident fund, salary and wages and other fringe benefits have mounted up to nearly Rs10 crore since last year. The Assistant Labour Commissioner’s (ALC) office had called meetings on several occasions but the management failed to turn up citing various reasons. Today’s meeting was called by the district magistrate and yet again, neither the owners nor the management attended it, prompting the administration to consider cancelling the lease. In fact, four separate cases of non-payment of provident fund have already been initiated against the Alchemist group and the labour department has also issued a show-cause notice to the management. “We will consider taking legal opinion to see if the lease of the owners can be cancelled as is the demand of the trade unions of the three gardens. A show-cause notice has also been issued and a court case can start against the management for failing to respond and they can be punished if found guilty. It seems that the management is not taking the matter seriously,” said Darjeeling DM Anurag Srivastava after the meeting. However, he said the management of the three gardens had sought a month’s time to clear the dues. 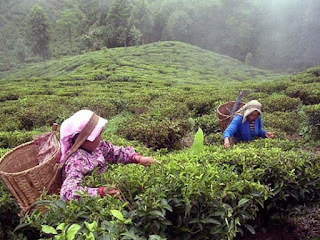 The Darjeeling Terai Dooars Plantation Labour Union (DTDPLU), affiliated to the Gorkha Janmukti Morcha, is spearheading an agitation to demand an early settlement of workers’ dues. The trade union also started a relay hunger strike from June 16 outside the district magistrate office in Darjeeling. The DTDPLU said the workers of Kalej Valley, Dhootriah and Peshok gardens have not received wage and salary from January 2016 and that PF, gratuity and other fringe benefits like medical, ration and firewood expenses are due since July 2015. “Yet again, the management did not attend today’s meeting spurning the district administration directive. We will continue extending the relay hunger strike and intensify our agitation till the management pays up the dues,” threatened Suraj Subba, the DTDPLU general secretary.